It is hard to imagine a place in New England with a richer story to tell than Litchfield. 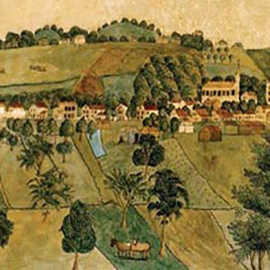 This exceptionally handsome town, founded in 1715 in Connecticut’s northwest hills, is considered one of the most historic locations in the state. Litchfield: The Making of a New England Town. By Rachel Carley. It is hard to imagine a place in New England with a richer story to tell than Litchfield. This exceptionally handsome town, founded in 1715 in Connecticut’s northwest hills, is considered one of the most historic locations in the state. It is hard to imagine a place in New England with a richer story to tell than Litchfield. This exceptionally handsome town, founded in 1715 in Connecticut’s northwest hills, is considered one of the most historic locations in the state. 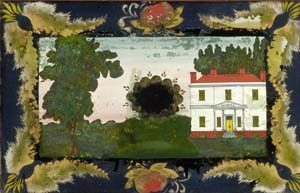 During the Revolutionary War years, the village was a center of patriotic activity; and in a subsequent period of cultural flowering, the community earned a national name for its excellent educational institutions, fine houses, and sophisticated residents. With the growing interest in New England’s colonial heritage during the late Victorian era, word spread of Litchfield’s well-preserved buildings and historic ambience, securing the town a reputation in the public’s imagination as the quintessence of early American tradition. This clock face shows a house similar in design to the Deming House on North Street. 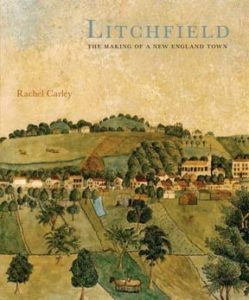 Litchfield: The Making of a New England Town presents the story of this remarkable place with a lively exploration of the buildings and landscapes of Litchfield Village, Bantam, Northfield, Milton and South Farms (now Morris) in a sumptuous volume illustrated with dozens of maps, photographs, and paintings— many published for the first time. 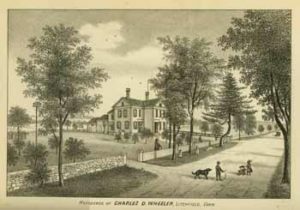 Charles D. Wheeler, a Litchfield farmer and politician, built his sizable farmhouse around 1840. The house, pictured in the 1881 History of Litchfield County , above, still stands on Hutchinson Parkway. Chapters covering the Revolutionary War period, Litchfield’s well-known Colonial Revival movement, and an impressive legacy of twentieth-century modernist buildings also offer new insight into noteworthy eras of Litchfield’s architectural achievement. 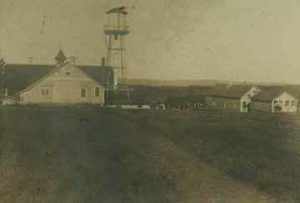 Published by the Litchfield Historical Society, Litchfield is the first comprehensive documentation of the town to appear since 1920. In documenting the building traditions that define the community’s distinctive sense of place, this important book makes a compelling case for preserving a remarkably rich cultural inheritance, while presenting a perceptive portrait of a Connecticut town whose story resonates far beyond its borders. Far View Farm attracted a succession of Northfield dairy farmers including Blanche W. Caton & Sons, who were the last to have a major herd there. Fire destroyed the main barn in the 1960s. From the Introduction: Common wisdom holds that Litchfield slipped into a period of economic doldrums after the prosperous post-Revolutionary War years, but the architectural evidence paints a markedly different picture. Construction actually accelerated throughout the 1800s, as improved communications and the introduction of rail transportation bolstered the New England economy and in the 1960s spread the flow of new ideas and building techniques inland from coastal cities. During this time, Litchfield’s increasingly successful farmers and industrialists built prolifically, leaving the town with a far greater legacy of architecture from the Victorian period than residents ever had produced in its much better-known colonial days. Although Litchfield is widely known for its historic colonial and colonial revival architecture, there is a modern story here as well. In 1950 Litchfield residents Rufus and Leslie Stillman were so inspired by the designs of Marcel Breuer that they hired him to design their home, the first of the five houses he would eventually design in Litchfield.Over the next twenty years, many other prominent modernist architects designed residential and civic projects in Litchfield. From the introduction: Litchfield residents who marshaled support for the first Litchfield Historic District in 1959 understood a fundamental precept of modern preservation legislation: The nation’s historically significant sites constitute an invaluable resource. In other words, protection of our cultural inheritance is legally justified on the grounds that it serves the greater public good—an argument that has been upheld by the U.S. Supreme Court. Drawing attention to that legacy, as the Litchfield Historical Society hopes to do with this book, is an important step in safeguarding it. Early victories notwithstanding, we remain at risk of the same kind of problems—tear-downs, sprawl, and open-space encroachments—that threaten rural communities everywhere. Litchfield’s longstanding reputation as the ideal New England community is certainly an asset, but it may also be a liability. In a town this beautiful, it is all too easy to become complacent. This compelling, sublimely illustrated volume is available in two editions. A hardcover is available at the Historical Society and at other select locations for $50.00 plus shipping. To purchase online, email museumshop@litchfieldhistoricalsociety.org or visit the book listing on Amazon here. Rachel Carley, a preservation consultant and architectural historian, holds a masters degree in historic preservation from the Columbia University Graduate School of Architecture and Planning. Her previous books include Building Greenwich, Architecture and Design, 1640 to the Present; The Visual Dictionary of American Domestic Architecture; Cuba: Four Hundred Years of Architectural Heritage; Cabin Fever; A Guide to Biltmore Estate; and Wilderness A to Z. 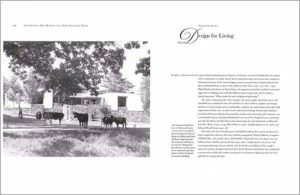 Her work has also appeared in The New York Times and Architectural Record. Ms. Carley is a resident of Litchfield.